IF Burger King’s senior executives are in a forgiving mood this morning, they will likely take pity on their besieged in-house social media gurus and offer them redeployment within the company. Their smartphones replaced with spatulas, they will be ushered in the direction of the nearest grill, where at the very worst, they will wrongly slice a sesame bun, as opposed to scything millions off the share price. The hacking of the fast food giant’s Twitter account (below) is the latest, and arguably the most high-profile example of a multinational enduring a very public meltdown on the social networking site, quite possibly because Dave from IT thought ‘rodeoBBQ123’ a paragon of infallibility, only to awake yesterday morning to find his out of hours work mobile phone had been ringing more than the collective eardrums of a My Bloody Valentine audience. For vast firms like Burger King, it is easy to see why they take the risk. The flowing, open nature of Twitter means it is a wonderfully rich resource, where a message or thought can be sent the world over by the ebbs and flows of others taking an interest, before ushering it on through their own little social tributaries. To big brand companies, such concepts are doubtless irresistible, but if they are incapable of appreciating the volatility such freedom brings, they deserve no sympathy. What shocked me most of all about the whole affair was not how a firm of such immense scale had allowed its account to be hijacked, but the sheer volume of people who witnessed every scurrilous off-message announcement which followed. 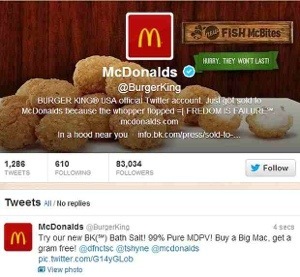 Prior to the story going viral, the @BurgerKing feed could already lay claim to a following more than 80,000 strong. In the hours which followed, that number spiked significantly, as curious users – scoffing vegetarians no doubt among them – signed up to see every tweet which contributed to a full blown public relations meltdown. There are numerous brands which are understandably popular on Twitter, from news providers such as the BBC and CNN through to tech firms like Apple and Samsung. They provide valued, unique content for a demographic eager to learn new information, whether it be topical events around the world or fanboy firmware updates for their tablet. But other than in the dull, leaden hope of receiving a voucher which can be exchanged for a thin, grey beef patty, the benefits of following Burger King do not strike me as immediately obvious. A glance at the genuine timeline entries prior to yesterday’s balls-up reveals witty, insightful 140 character-sized gems such as “How many bites does it take you to eat a BK® Chicken Nugget?” and “RT if you wish you were eating BK® French Fries right now.” Rob Delaney and Caitlin Moran, I’d suggest, can sleep easy. But still people sign up, insistent on explicitly declaring their affinity for brands with no discernible personality, voice, or charm. Burger King, by way of follower numbers, is merely, er, small fry. Taken together, the accounts of McDonalds, Coca Cola, and Starbucks can claim over five million people reading their every word (granted, a good few of those are probably Ukrainian sexbots with a fine line in pre-programmed inspirational aphorisms, but they’re still outnumbered by the real people). Twitter, I should add, is not the only place where this curious phenomenon is gathering pace. I am no less perplexed when browsing Facebook, making mental reminders to either hide or unfriend anyone who cares to share their affection for Amex, Amazon, or Asda by clicking the ‘like’ button in the manner of a sugar-high toddler playing Whack-a-Mole. Both sites appear mindful that their userbases are nearing saturation – indeed, Facebook is now losing members in Britain – and is therefore doing what any business would do, whether old or new media: grab the money. The proliferation of paid-for pages and promoted tweets only serves to encourage people to hitch themselves to the brand wagons. There are even companies dedicated to forging unsavoury marriages between celebrities and companies so as to spread sponsored endorsements. Take ad.Ly, a marketing agency which has been hired by the likes of Warner Brothers, NBC, Microsoft, and Sony to hawk their wares via well-kent actors, musicians, and sports figures. The company promises to “create and amplify branded social content at scale” and “spark authentic conversations between celebrities and their fans. The topic of conversation? Your brand.” If that doesn’t leave you wanting to scrub yourself with a wire brush and carbolic soap, consider the fact the firm counts well-rounded, financially threadbare figures such as Charlie Sheen and Mariah Carey among its eager brand pimps. I don’t for one minute consider this form of advertising any less insidious or morally bankrupt than the kind we see on our television screens and read in glossy Sunday supplements – the omnipresent, addictive brand allure will continue to exert a hold over people, no matter how it manifests itself. What is does highlight, however, is the hollow, characterless presence that brands like Burger King have on social media, and the pointless, unfulfilling charade of following them. But still people do. Why? When I expressed incredulity about this on Twitter – where else – an equally resigned follower made a sage observation in light of Krispy Kreme’s recent arrival on these shores. Even in Scotland, we now live in a world where people will queue for hours for a box of doughnuts. And who knows – if you tweet about how tasty they were, you might even get a free one.